Septuagenarian Alan Ayckbourn has written over seventy plays in his life. He has sometimes been dismissed as the creator of facile ‘suburban farces’, but today the genius of his work in shedding light on the way Britons live, and the values they hold, is widely recognised. A Small Family Business was written specifically for the Olivier Theatre at the National where it premiered in 1987. Telling how the steadfast Jack McCracken suddenly finds himself complicit in misdemeanour after misdemeanour as he tries to put in order the family furniture business he has taken over, it finds, and exploits to the full, the secret to good stage writing. Any drama presents exceptional events in some way, because if it only portrayed our own lives in all their mundaneness it would hardly make for scintillating viewing. In the case of A Small Family Business, however, the extraordinary episodes are the natural extension of an underlying theme to which we can all relate, that of petty fiddling. Who at the end of the day hasn’t stolen a pencil from their office, or stayed behind after work to print personal documents? And who, in truth, hasn’t believed that their actions weren’t entirely acceptable? Ayckbourn thus takes a familiar premise and reveals the disturbing consequences when it is taken to its logical conclusion. Much as we may detest the actions we see late on, we cannot help but appreciate why certain protagonists, under the circumstances, took the only course that would not spell disaster for themselves. The result is that we empathise, even as we judge. 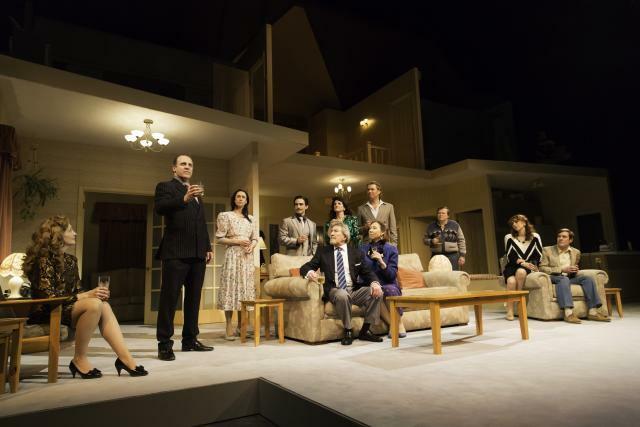 In Adam Penford’s production everything is played out to strong effect on the Olivier Theatre stage, with Tim Hatley’s set design fulfilling Ayckbourn’s original vision well. Ayckbourn knew the answer to filling such a large space was to create many smaller ones within it, enabling different scenes to occur simultaneously. In the resulting two-storey house certain walls are cut away so that we see everything, but all doors remain in place so that each room has its own clear parameters. The performances are also superb with particular accolades going to Nigel Lindsay as the increasingly torn Jack, Debra Gillett as his frequently exasperated wife Poppy, and Matthew Cottle as the oily blackmailer, Benedict Hough. In rep until 27 August 2014 at the National Theatre, South Bank, London SE1 9PX with start times of 14.00 and 19.30. For tickets (£15-£50) visit the National Theatre website. A Small Family Business will be broadcast live to cinemas around the country on 12 June and further select dates. For full details of times and participating venues visit the National Theatre Live webpage. Londonist received a complimentary ticket and programme from the National Theatre press team.